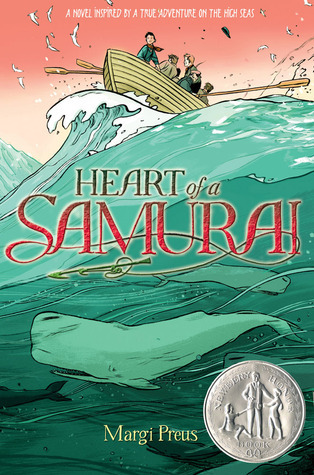 “Heart of a Samurai: Based on the True Story of Manjiro Nakahama” (Amulet 2010) by Margi Preus won a Newbery Honor in 2011. In a freak storm at sea, Manjiro, a teenaged Japanese fisherman, is shipwrecked on a barren Pacific island with three companions in 1841. Just short of starving, they’re rescued by an American whaling boat. Amidst the brutal but fascinating whale hunting adventures, we experience the cultural distrust between the Japanese, who had isolated themselves for centuries and see the Americans as stinking barbarians, and the Americans who see the Japanese as godless cannibals. Fortunately, the ship’s Captain Whitfield befriends the open-minded and curious Manjiro. When he drops Manjiro’s compatriots in Hawaii, he offers Manjiro the opportunity to continue the adventure—whaling–and sail to Massachusetts to be his son. Manjiro attends school in New Bedford where he works to bridge the mistrust and misunderstanding of his country. When he finally returns to his homeland, the Japanese imprison him, until he’s able to explain to his countrymen the marvels and industry of Americans. Had Manjiro’s life not been set askew, he would have remained a fisherman in Japan. His adventures led him to become a high-ranking Samurai who helped bridge the differences of two great cultures. The drawings of the actual person, Manjiro, are sprinkled throughout this beautiful page-turning cultural and sea-faring adventure. 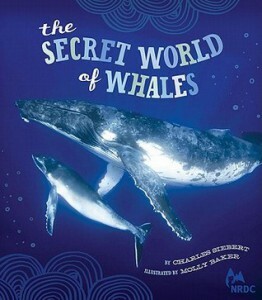 “The Secret World of Whales” (NRDC/Chronicle 2011) by Charles Siebert is the perfect companion piece, offering the history and early technology of the brutal business of whaling. Eight thousand years ago, people world-wide risked their lives in small boats to hunt a whale which would feed their village for a winter. The invention of the harpoon with trailing rope was bad news for the whale. By the thirteenth century, the Basque who live between Spain and France, supplied all Europe with whale meat, blubber boiled down for lamp oil and machine lubricants. Bones, skin, and baleen were used for shoes, fence posts, and whips. By the nineteenth century, world economy was built on whale products and these stately beings were hunted nearly to extinction. Scientists began researching and discovered that whales’ brains are much like humans. They sing. They’re compassionate. They dream. Work began to save the remaining whales and continues today. The final chapter relates interactions between humans and whales that moved this reader to tears. I recommend you read both these books. I hope you’re reading these books and perhaps ranking the 5 Newbery Winner/Honors. Next up are: “One Crazy Summer” and “Dark Emperor”. Love your reviews Patty. Some are really touching, others make me laugh. I remember some of my own childhood experiences and reactions when I read your reviews (like the flashlight under the covers), and connections with animals, especially in Midnight Zoo, so strongly remembered from my own childhood… and adulthood.